WASHINGTON – Latino voters went to the polls Tuesday focused on immigration reform and jobs, according to a pre-Election Day poll of Latino voters across the nation and in 10 key states – including Arizona. The poll – conducted by Latino Decisions and sponsored by a coalition of Hispanic advocacy groups – found that 48 percent of Latino voters surveyed in Arizona cited immigration reform as the most important issue facing their community, followed by jobs and the economy at 33 percent. Education came in third, polling at 26 percent. Arizona voters mirrored Latino voters nationwide, where 45 percent said immigration reform was most important and 34 percent said it was the economy, according to the poll. Advocates in Arizona said the results were not surprising. The poll was based on phone interviews with more than 4,000 Latinos who had already voted or were sure to vote and was conducted between Oct. 30 and Nov. 3. The margin of error was plus or minus 4.9 percentage points. But the big question Tuesday was whether Latinos’ concerns about immigration and other issues would translate into votes in Arizona and across the country. National and state immigration advocacy groups remained hopeful that frustration with Congress’ failure to enact comprehensive immigration reform, and President Barack Obama’s delay in taking action on his own, would push Hispanics to show up at the polls. 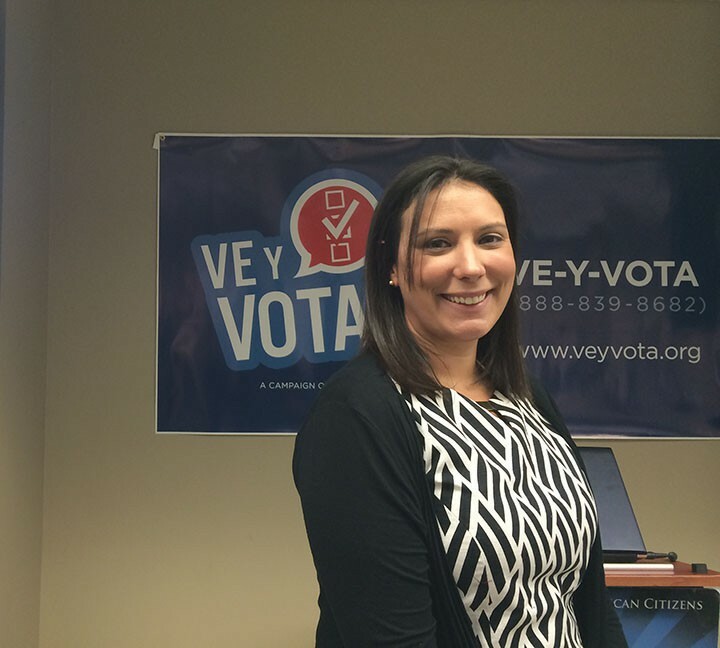 “We have heard … some groups saying around that Latinos are not going to vote because they’re mad at what’s been happening with Congress,” said Laura Maristany, a spokeswoman for the National Association of Latino Elected and Appointed Officials. “What we’re telling Latinos is that they should vote. The angrier that they get, the more that they should vote,” she said. Immigration has topped the list of issues on the minds of Hispanic voters in Arizona since 2010, Heredia said. That was the year state lawmakers passed SB 1070, the state’s tough immigration law. 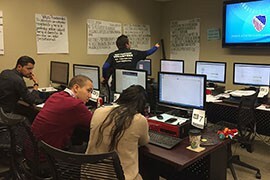 Heredia said his group – a coalition of grassroots advocacy organizations that works to mobilize Hispanic voters – has seen “steady growth” in the state’s Latino electorate since 2010. The group has succeeded in tripling the number of Latinos signed up for the state’s Permanent Early Voting List, from 94,000 in 2010 to more than 300,000 in 2014, he said. On Tuesday, One Arizona had more than 100 people out canvassing and making phone calls to get out the Latino vote. Hispanics make up around 20 percent of the state’s total registered voters. But Heredia said he expected Latinos to be about 14 percent of the statewide electorate Tuesday. “We still have a lot of work to do, but we’re moving ahead into the future,” he said. 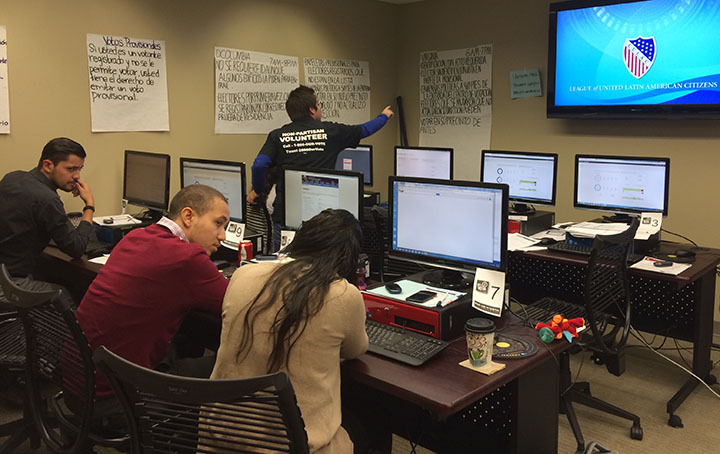 Advocates fielded calls in Washington, D.C., from voters around the country on Election Day in an effort to make sure minority voters knew where and how to vote and to head off any problems with voters being turned away. 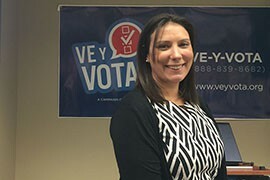 Laura Maristany of the National Association of Latino Elected and Appointed Officials said her group was urging Latino voters across the country to channel their frustration with the lack of immigration reform into action by voting on Election Day.